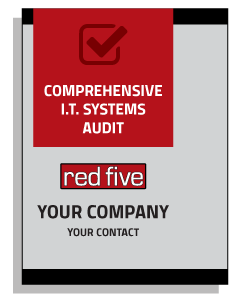 Get a complete evaluation of your I.T. Services. Get your detailed and comprehensive report for only $249. Determine the strengths and weaknesses of your I.T. System and discover opportunities to save money. When you have one of our certified technicians research your system and complete your report you will learn how you may be at risk and how you can shore up security threats. There are no obligations to engage in a contract or more extensive service. Just an opportunity to learn what could cost you thousands down the road. Get started today. Certified professional will present your report within 2 weeks of a scheduled evaluation. Comprehensive report and mission plan. Save time and money with efficiencies. Assess your risks and vulnerabilities.